Let's talk about quick and easy weeknight dinners because it's a subject that comes up often around here. It's actually most likely to come up at about 6:00 pm when I look up from my computer screen and realize that I haven't planned anything for dinner. So that's when I take a moment to consider my options: take-out (nah), scrambled eggs (again??) or a kitchen rummage to see what I've got that's quick. And because I know I'm going to be having this conversation with myself on a regular basis, I try to stock my kitchen with good, quick cooking item. One item I frequently have in the fridge is pre-cooked flavored sausages. 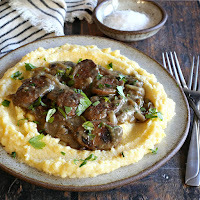 I only need to heat them through and while I'm doing that I can make a quick gravy and a pot of easy, creamy polenta. 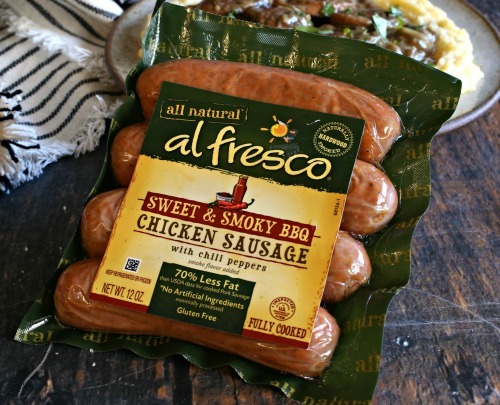 My go-to is Al Fresco's chicken sausages because they have less fat and sodium than traditional sausages but are still packed with flavor. There are 10 varieties and I usually keep a few different ones around. For this dinner I grabbed the sweet and smoky BBQ but pretty much all of them would work for this simple recipe. The inspiration comes from the British classic of bangers and mash but using the short cuts of the pre-cooked, and lighter, chicken sausage and the quick cooking polenta. 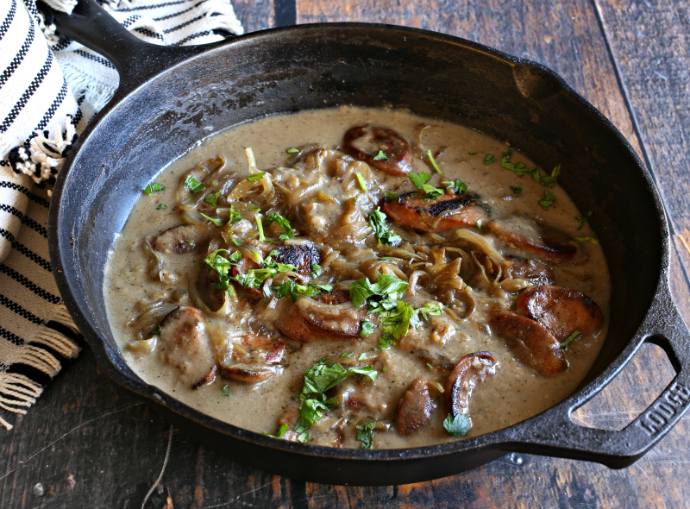 That onion gravy, though? That's a must. Enjoy! Add the olive oil and onion to a large skillet and cook on medium heat, stirring often, until the onions soften and begin to caramelize lightly. Remove the cooked onions to a plate and add the sausages to the pan. Continue cooking on medium heat for 3 - 4 minutes on each side, just until the sausages begin to brown. Add the sausages to the plate of onions and add the tablespoon of butter to the hot pan. Stir in the flour until fully coated and then slowly whisk in the chicken stock. Stir in the mustard and continue cooking, on medium low heat, until the gravy begins to thicken. Stir in the cream, parsley and pepper. Season with salt, to taste. 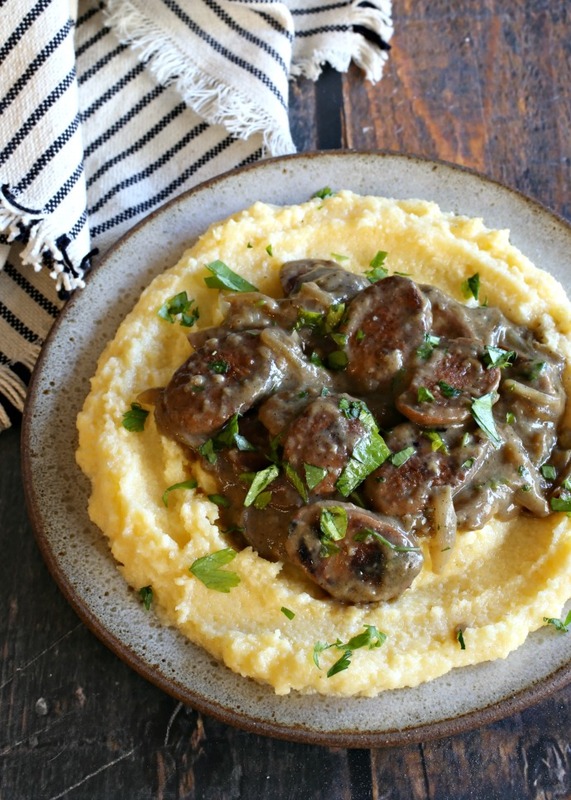 Return the sausages and onions to the pan and simmer in the gravy, on low heat, while you make the polenta. Add the polenta, water and milk to a pot and cook on medium heat, stirring often, until the liquid is absorbed and the plenta is soft. 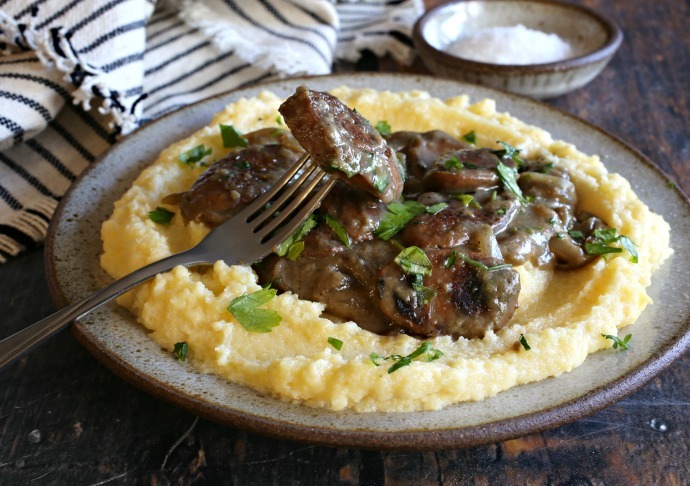 Serve the sausages and gravy over the creamy polenta. This recipe is sponsored by Al Fresco. Thank you for supporting the products I love and use in my kitchen.